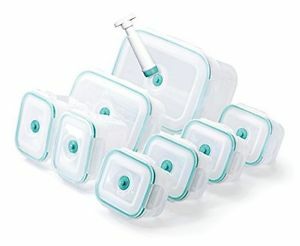 I was planning in investing in a set of vacuum food containers, something like these with the pump to remove excess air. It took me a while to find the ones I wanted, and in the process I started questioning the benefits. I've found references that it prolongs the time food can remain good for up to 3-5x times as opposed to storing at just in a fridge. However I haven't found any references related to what are the benefits compared to just using an air sealed container without pumping out the air out. It's true that keeping air away from most foods will increase their shelf-life, but so-called "vacuum" food containers can't possibly create a powerful enough vacuum to remove all the air. I would be suspicious of glowing reviews with wild claims of their effectiveness. For the purpose you described, I think you would be much better off using a good quality plastic wrap. Pressed tight against the food all the air is removed and the cling-wrap plastic makes an air-tight seal. For a fraction the cost of what you're considering, invest in a heavy plastic wrap box that has a sliding cutter. Because you don't have to struggle with this kind of box, the plastic wrap doesn't get tangled up. You can cut off exactly the amount you need, so it makes sealing up foods very fast and efficient. You can refill such a box with inexpensive store-brand, but it's worth paying a few cents extra to buy professional grade plastic wrap because it stretches and seals much more effectively. Plastic wrap can be used to seal or augment the seal of most any container you already own, so your choice of size and shape is limited only by the width of the plastic wrap roll. You can also do things like line a bowl or cup with plastic wrap to hold it while you add the food. Sealing the plastic will form an air-tight, liquid-tight seal that can often stand on its own for refrigerating or freezing. Although it can sometimes be reused, there's also the big advantage of being able to simply toss the plastic wrap in the trash or recycling bin instead of washing it. Plastic storage containers ("vacuum" or otherwise) are notorious for retaining food odors, and attempting to sanitize them in the dishwasher doesn't always end well. As Catija points out in the comments, a vacuum sealer is another option to know about. 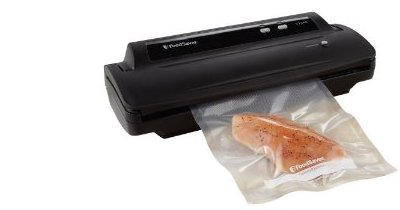 While it may not be cost effective or practical for everyday leftovers, vacuum sealing in plastic with a machine is beneficial when freezing, marinating, and for sous vide cooking. There is no reason why this thing will extend shelf life with regard to food safety. It is by no means comparable to canning, where you first sterilize the food and then ensure that there is some vacuum in the jar, as a sign that the jar is not exchanging atmosphere with the outside environment (which would bring in contamination with new microbes). Store-bought vacuum-packed food may also have been processed under sterile conditions even if not canned, which extends shelf life some, but this is irrelevant to home food storage. It will probably slow down the growth of aerobic bacteria, but aerobic bacteria are not the only ones you have to care about. The most I could imagine is that it is useful for storing things like cut apples or avocados, which will get an unsightly brown when they sit out in the air. It has nothing with food safety though, just with freshness. This is not conditional on the vacuum quality, the same would apply to a more efficient method of producing vacuum. Not the answer you're looking for? Browse other questions tagged storage-method storage-lifetime storage vacuum or ask your own question.